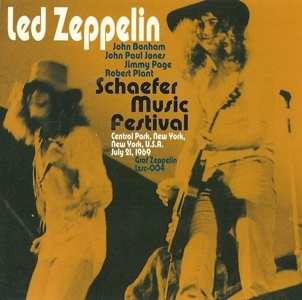 The Schaefer Music Festival was a series of concerts organized by New York promoter Ron Delsner sponsored by the Schaefer Beer Co. His official website history states: “In 1966, Ron Delsener developed and produced the highly successful concert series at Wollman Ice-Skating Rink in Central Park. During its fifteen-year history, every major contemporary artist appeared at this series, including: Billy Joel; The Who; Louis Armstrong; Miles Davis; Benny Goodman; Otis Redding; Wes Montgomery; Bobby Darin; Muddy Waters; Flatt & Scruggs; Howlin Wolf; Neil Diamond; Stevie Wonder; Sly & The Family Stone; Led Zeppelin; and many more. Led Zeppelin played two sets on July 21st. Only the first exists on tape and has been in almost constant circulation. It’s a very clear and enjoyable set and also one of the longest shows on tape from their summer tour. The last couple of silver pressings of this tape include Complete Central Park (Sanctuary TMOS96901), The Woody Woodrocker Show (Tarantura TCD-23) and Live In Central Park (Empress Valley EVSD-456/457). Schaefer Music Festival on Graf Zeppelin is the latest and probably the final word on this show. Its sound is very clear and rich, doesn’t have any of the little problems found on the other titles, and has the full epilogue where the tapers record themselves leaving the venue. Central Park is a popular tape because it presents their shorter and more intense festival set debuted earlier in the summer. It has both “You Shook Me” and “White Summer/ Black Mountain Side”, two songs which would be alternated in other concerts pushing the duration to just over an hour played in front of a vocal and rowdy New York audience. What follows is a fourteen-minute version of “Dazed And Confused” sounding very similar to the June BBC recording. Plant adds his orgasmic moans before his nonsequiter interjections during (“I want you to talk to me”) and after (“bamma lamma ding dong”). A heckler interrupts Plant with “White Summer!” “In a bit. It was written by Willie Dixon. It’s a thing we in England heard on and EP called Muddy Waters Twist. I don’t know what that means really but this is called ‘You Shook Me’.” What follows is a slow, heavy version of the blues piece with Plant struggling to reach the high notes by the end. There is another heckler at the end to which the audience laughs, but what he says is inaudible. There is some audience commotion at the end of the piece and Plant chides the audience to be quiet. “White Summer”, which was requested by the audience, sounds fantastic in this show with Page pushing the boundaries of the eastern scales. “How Many More Times” is one of the earliest to contain an extended medley. They throw in the “Woody Woodpecker” theme during the staccato riff early in the number, and this is the first reference to Buffalo Springfield’s “For What It’s Worth”, a song that plays an important role in Zeppelin’s history (from the “Whole Lotta Love” medley to their induction into the Rock And Roll Hall Of Fame in 1995). A short, compact version of “Communication Breakdown” is the only encore before the band leave the stage for the second performance of the evening. Central Park is one of the best 1969 performances, showing a very loose band in constant dialogue with the crowd. Several years ago forty minutes of color footage surfaced with sound. It’s currently in the Bill Shelley Archives based in New York, but has not been released due to licensing conflicts and discussions. Shelley’s company has a licensing agreement with Eagle Vision DVD for the Zeppelin (along with other rare films) to be officially released. Hopefully the band will soon give their consent. Until then, this audio document on Graf Zeppelin is definitive.